Happy Friday Fashionistas! Is it fall where you live yet? Rocking those great fall trends? You know, it occurs to me that it's hard to rock anything when you're worn down and not well maintained. To that end, I bring you DIY Spa Day! Taking out some time to relax without breaking the bank at a professional spa is what you deserve, so light a scented candle, play some relaxing music, run a warm bath, and pour some wine.... after you check out these top videos to help you perform some body magic. Well, there you have it! With even a few of these amazing tips from gathered youtubers, you can have a productive and relaxing spa day and come out looking great. Did we miss anyone? Let us know by facebook or comment below! If we like it, we'll share it! Hopefully this article is being read in a preventative manner, but every lady knows eventually you will have a bad hair day. Maybe your hair is in that funky grow out stage between short and mid-length, you have too many grays, greasy hair, a naturalista with crunchy frizzy curls, or a relaxed lady with too much new growth, or a combination of several-- the point is your hair is NOT the business! Well, Gathered Lady Bree to the rescue! This past friday, I was in hair hell myself. My curls were wack (dry, undefined in the front, mashed flat in the back, dull, and insanely frizzy and super big). I had almost no time to get out of the house and a wash and go wasn't a viable option! Here's my favorite style saves for bad hair days! Hair Problem: "My Hair is SHOULD NOT be seen by human eyes"
Hair Problem: "My roots look horrible". "My Hair is too greasy". "I have too many grays". Hair Problem: "My ends are frayed and damaged." "My Hair is overprocessed and dry" "I am a transitioning natural and I have two textures". "My roots are puffy but the rest of my hair is straight"
Have you rocked one of these fab styles or have other Bad Hair Day styles that rescue your look? Share your pics with us and if we like it, we'll share it. You can email us at thegatheredlady@gmail.com or find us on Facebook, Instagram, or Twitter @TheGatheredLady ! Happy Friday Fashionistas! Well ladies, I am back after an amazing birthday last week. My gift to myself: a week of pampering - fancy restaurants, housekeeping services, parties, and a fancy weave to top it off. All of this has led me to believe that I was MEANT to live the high life. Too bad my bank account is holding me back! For our topic capping off this week's fabulous posts, I have worked some magic to combine Bree's awesome DIY nail polish tower and Charity's manicure maintenance. 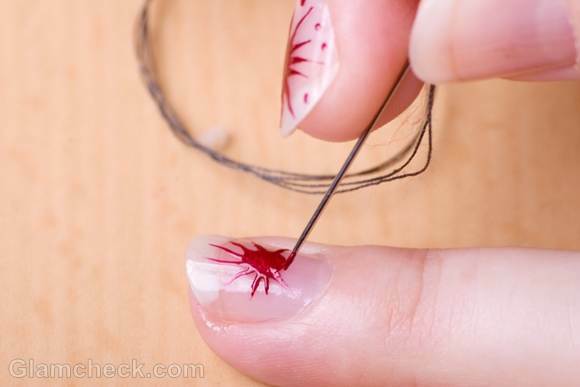 We are going to cover how to rock THE hottest trend in nails -- the DIY trend! Scotch tape makes a great stencil. You are limited only by what shapes you can imagine to stencil. Some clever girls put their scrapbooking tools to use -- think patterned scissors and punches. Those super fine lines you would need to draw are sometimes best accomplished with a needle, dragged through polish. 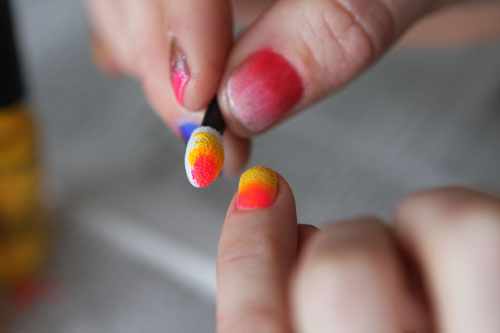 Sponge painting might be out in home decorating, but it is most definitely IN for ombre nails! Just dip and dab ladies...dip and dab. Really ladies, this is only the beginning. Get out there and look for yourself! Ladies are using tinsel, drinking straws, cling wrap, toothpicks... you name it. Use your imagination, and yours could be the next pinterest pic with 3,000,000 repins. 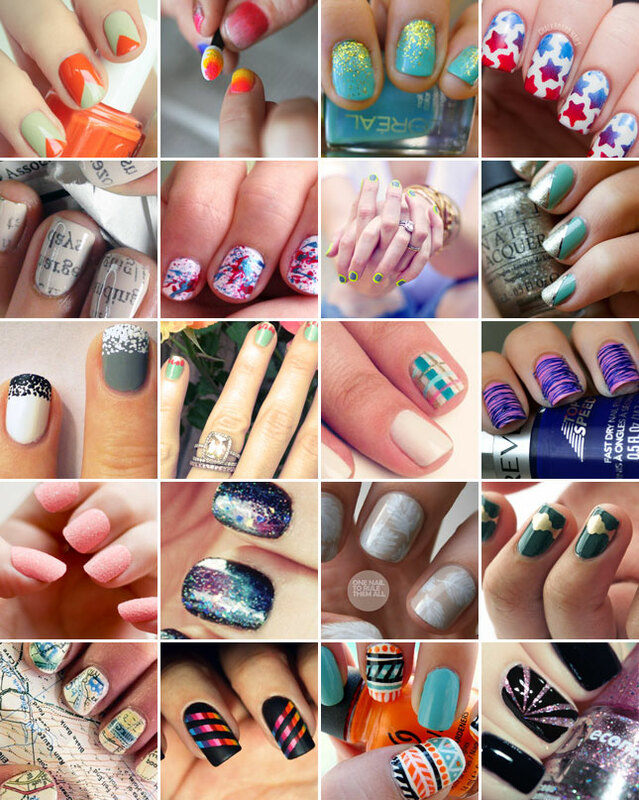 Have a nail design to share? Email us or share with us on facebook, and if we love it, we'll share it! Hi Fashionistas! I ran across this super cool DIY project from Life Ann Style . It's a fairly easy project that should cost less than $10! You can use cool plates from the thrift store and you can customize it for your particular needs. 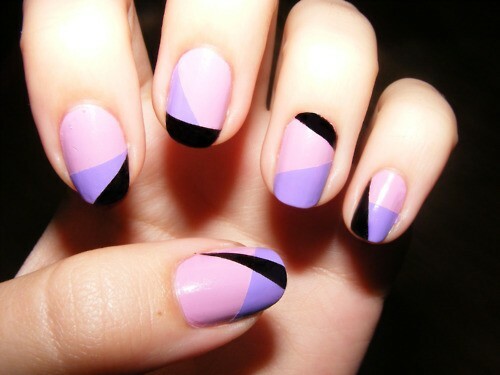 The girl in the video uses it for nail polish also, which I personally love. I love DIY and I'll post my pics on this project later. Also, I'll be showing you how to make a custom wall display for jewelry and accessories later this month. She also has detailed step- by- step insturctions with material lists. Enjoy and Happy Monday!